A friend sent me this CD in the mail. Despite being on "Old School Metal Records", I was bit worried that Anger As Art would be another in a long list of crappy neo-thrash bands whose sound is more along the line of metalcore bands than any sort of classic thrash metal. The crappy album cover art didn't do much to quench that worry either. However it didn't take long to see what was really going on here. The album starts off with "Catharsis", a song that pure anger put to music. Fast and furious, this song was the perfect lead off song. 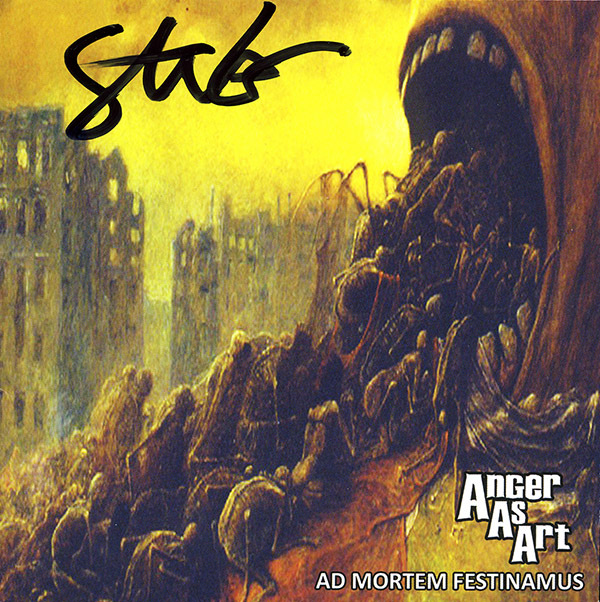 Indeed, Anger as Art are a competent neo-thrash metal band. The band is the creation of thrash metal legend Steve Gaines (of Abattoir fame). Had I known this ahead of time I probably would have been less apprehensive. "Callous And Furor" is heavy and fast bring back the excitement of bands like Slayer, At War, Dark Angel, and of course, Abattoir. "No Seed of Mine" is a perfect example of this. I can't imagine any old school thrash fan not appreciating the opening riff of this song. That's not to say that every song on "Callous and Furor" is fast all the time. Gaines knows the importance of mixing up tempos to create songs that are dynamic and interesting. The vocals are of the shouted variety and at times and are probably the weakest part of this CD, although I far prefer this style of vocals to that of the screamed metalcore variety. 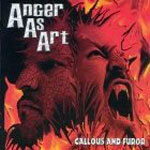 Anger As Art return with its fifth album after gaining some much deserved underground notoriety with 2013's "Hubris, Inc." Anger As Art is the band headed up by Abattoir's Steve Gaines, whom I personally purchased this CD from at the San Diego Heavy Metal Swap Meet in 2016. The album as a while would stand tall with the best of the modern thrash fare but with a definite throwback luster created by the riff work. Though the album is mostly built around two speeds, fast and faster, there is a bit of a U.S. power metal vibe to the whole thing as well. Basically it's a metallic assault to the ears, but not of the boring metal core variety. After the short instrumental opening the first true song on the album sounds like something Holt & Hunting may have come up with circa 1985. This is a vicious thrash metal monster and was the right song to open up the album. The pummeling continues with "Aim for the Heart" with it's impressive drum work, biting riff work and gang vocals. The thrash metal hammer continues to swing throughout the album from the short, tongue-in-cheek "L.A. State of Mind" to the vicious "Unknowing, Undead" right through the albums longest track "Dim Carcosa". The final track starts off with some eerie organ music mixed with some shredding guitar licks before unleashing the final sonic assault. The song ends with what sounds like an old church hymn recorded back in the 1950's. It should also be noted that the vocals on the album are aggressive and abrasive yet not of the boring, standard growling or the pseudo-macho metalcore yelling that dominates much of modern heavy music. Steve does use the occasional growl but for the most part it's those gruff, razor-blade thrash vocals and higher pitched screams. Overall, "Ad Morten Fetinamus" is a fantastic album from a band that deserves far more notoriety than it currently receives. Of course I'd say that about several of Steve Gaines projects from the past as well including Abattoir and Bloodlust.